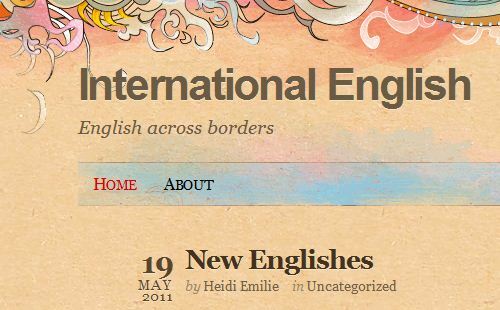 I started writing on my blog for use in class March 2008. The first month I had 43 visitors! I was in the beginning reluctant to start since I was afraid of what others might think about it and my spelling mistakes! That year I visited many schools and the teachers would ask me if I could share some of the cool stuff I had found on the net and used with my students. The learning management system we use in Akershus Norway is not easy to use when sharing with other teachers. The following year 2009 I asked my students to write blogs too. Here are some points about using blogs in class that I would like to share. It is actually an answer to a fellow teacher in Finland who has kindly commented on my blog and also asked me some questions. FACTS: All my students have individual blogs and I link them to my own web-page in the sidebar. That way it is easy for the students to read other students’ text and learn from each other. Sometimes I have other teachers comment too. I will in August remove my old students’ blog links and add the new ones for my new class. If I had more then one class I would probably do this on a separate page. Q1. You use WordPress for your own blog but the student blogs are on Blogger. Any reason? Student choice? Do you find Blogger easier for students to use? A1: I love WordPress and swear by it. My students can chose what they want to use. I show them Blogger because it is easy. This year I think 3 students used WordPress too. Q2. All your student blogs seem to be publicly viewable. Did you ask your students’ opinion about it or was it just taken for granted? Did any of them protest? Are any of them underage, and in that case, did you have to ask their parents’ approval? A2: We talk about it and so far nobody has objected. They are 17 when we start the school year. I do not ask parents’ approval. They do not submit pictures or full names on the blogs. All they write about is school related. If they write anything personal I ask them to remove it. One time a student wrote about another teacher. It is actually a good teaching opportunity. They get it. Q3. Do your student write their blog mainly at home or do you also do it in class? A3: They mainly write in class. Sometimes they have to finish at home. I think it is a good idea to do both. Q4. Do you correct your students’ writing in any way? Or do you give them individual feedback in some way? I noticed that you have written encouraging comments in most of their posts – do you find this takes a lot of your time? A4: I never correct anything on the actual blog. Sometimes when they have many spelling/grammar mistakes I correct it in Word and send it using our LMS. I asked them to correct the blog post. After we found that many are actually reading their posts they were more eager to correct. They have an actual audience out there. See this post where I wrote more about blogging. I pride myself with reading everything they write. And I try to comment everything too. It takes a lot of time that is true. But I think it is wort it. I make an RSS feed and look at it everyday. They usually write at different times and that makes it easier. I quickly know who need more attention and who writes really well. I must say I thoroughly enjoy it. I learn a lot too. Thank you so much for your answers and advice. It helped a lot to guide my thoughts and planning. Great idea to blog this to share with any other newbie student blog users! I can guess why you enjoy reading your students’ blog post so much. I hope to read some more creative and varied student writing, as opposed to the standard, often dull, traditional essay topics. It’s fascinating how many readers your students have! I will suggest my students read your students’ blogs for interest and inspiration. Thank you so much for sharing your experience, it certainly gives me ideas on how to set up blogging as part of our classroom environment. So far I have only used it as an “extra”, encouraging students to comment nd share thoughts on our (my, to be honest) classroom blog. But I’m convinced that blogging is a fantastic learning opportunity, as it is for me, too. Thank you for your comment and good luck with your work. I know blogging is a fantastic learning opportunity!